Falling silver prices were a trouble spot for silver miners last month, but here’s why Great Panther Silver bucked the trend. Image source: Great Panther Limited. Shares of First Majestic Silver Corp. (NYSE:AG) fell 14% last month, Hecla Mining Company's (NYSE:HL) stock declined 13% -- and fellow silver miner Great Panther Silver (NYSEMKT:GPL) saw its shares advance 11%. What exactly was going on in December that led to these vastly different price moves? 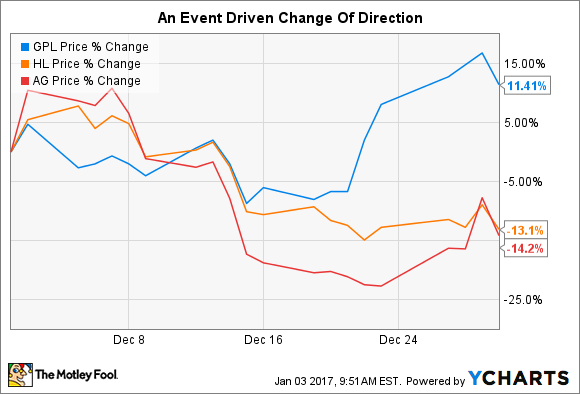 The big driver of First Majestic's and Hecla's stock moves in December was falling silver prices. The precious metal started off December at around $16.50 per ounce and ended at about $16 per ounce. Not a huge price swing, but the continuation of a downtrend that began in August and picked up speed after the U.S. elections in early November. And it was enough of a drop for investors to question their commitment to this pair of silver miners. Dealing with often-volatile commodity price shifts is part of the package when you own a precious metals miner. Interestingly, Great Panther Silver's shares were tracking right along with Hecla's and First Majestic's up until mid-December. That was when Great Panther announced that it had agreed to acquire Coricancha Polymetallic Mine in Peru for $100,000 plus an amount equal to cash on hand in Coricancha at the time of closing and an earn-out of up to $10 million. The mine isn't currently in operation. Great Panther, which has been looking at this mine for a while, believes it can bring it back online for around $25 million. Furthermore, it expects the mine to produce around 3 million silver equivalent ounces per year. That's a huge number when you compare it to Great Panther's projection that its current mines will produce between 4 million and 4.2 million silver equivalent ounces in 2016. So this new project represents a material growth opportunity for Great Panther. More important, the upfront cost for the mine was virtually nothing -- a pretty good deal. And Great Panther has around $50 million in cash on hand, which is more than enough to get the mine back up and running. No wonder investors decided to take a more favorable view of Great Panther despite falling silver prices. Neither Hecla Mining nor First Majestic had such positive news to blunt the impact of commodity price swings. Clearly, precious metals prices play a big role in the short-term price swings of companies like Hecla, First Majestic, and Great Panther Silver. But there are other factors to consider, too. In December, Great Panther's aberrant stock advance showed that things like acquisitions can turn the tide. However, commodity prices are still an important issue, and it would be unwise to think that Great Panther has somehow detached itself from the commodity. Keep an eye on the new mine and on Great Panther's progress in getting it back up and running. It could have a big impact on the miner's business. But don't stop watching silver prices. Eventually, the euphoria of the acquisition will wear off and silver's price swings will, again, have a disproportionate impact on Great Panther's near-term stock price.